Ocean (my daughter named her) got her leg caught in the tree the other day, as she was getting down in the morning. Our current flock of chooks decided to forgo their lovely house and sleep in the lemon tree, which has always seemed quite natural as well as beneficial to the tree, but in this case it turned out to be a problem. When we found her she was hanging by that one stuck foot, almost upside down. That was a little over a week ago. At first we hoped it was just sprained, not broken, but on inspection the angle definitely suggested a break, and more than a hairline fracture too. So what to do? We decided a while ago that we will not be taking our chooks to the vet. 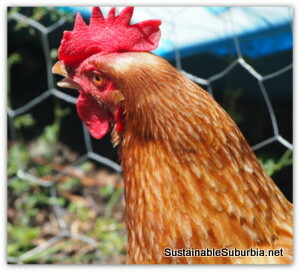 We simply can’t afford it, so we take a pragmatic approach, loving them as pets as well as producers, and caring for them as best we can ourselves, including growing some of the useful herbs and plants for backyard chickens. 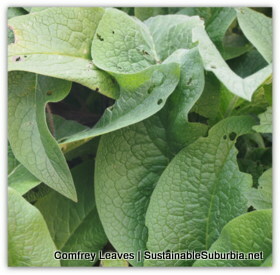 In this case, the useful plant is comfrey. I’ve read that you can use plantain as a substitute for comfrey for helping broken bones, which is a common enough weed around here, but we have stacks of comfrey, so that’s what I used. I made up a comfrey tea by soaking comfrey in boiling water until it was the colour of tea, then I cooled it down with some ice cubes. When the tea was cold I took some out to use internally, then we carefully held her and soaked her leg in the remaining tea for a few minutes. To be honest, we could probably have done it for longer, but she was not very impressed. In Backyard Poultry Naturally, Alanna Moore recommends soaking a broken leg in comfrey tea two to three times a day, and giving a teaspoon of the tea internally at the same time. I have to admit, we never managed three times a day, and by a week in, it was once a day if she was lucky. But it seems to have helped all the same. We didn’t have the know-how to reset the bone without potentially making things worse, but it’s important that the break is given a chance to heal – even if it’s not perfectly straight anymore. So we splinted her leg too. To do that, I used two short plastic splints and a length of old pantyhose. I made the splints out of my daughter’s craft set, using three different widths of straw, one inside the other, inside the other, to get a strong enough splint that was also easy to chop down to size. I used a little blue tack in each end to hold it together, and also to ensure the ends weren’t sharp. 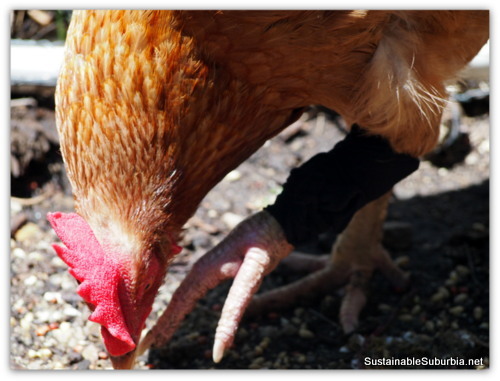 I first wrapped a cold comfrey leaf around her leg (one that had been soaked in the tea and wasn’t prickly anymore – I’m not sure if that would matter to a chicken, but it sure felt better to me), then I wrapped a layer of pantyhose around that. That held the comfrey in place and also protected Ocean’s leg from having the splint dig in to it. Then wrapped the rest of the pantihose around, placing a splint on either side as I did so. As soon as we put Ocean down, we could see the splint had improved things for her. She could now put a little weight on the leg for balance, where before it would just immediately collapse under her. We have also been adding apple cider vinegar to the chooks’ water, to improve immune function, and adding milk powder or yoghurt to some mash made especially for Ocean, for the extra calcium and protein. We have re-done the splint and banaging once, after a week, to take out the comfry leaf. I figured it could potentially become irritating. One week on, the break is not healed of course (that will take weeks at least, I guess), but Ocean seems much improved, morale-wise. She’s not walking on the leg, which I take as a good thing for the healing process, but she will use it for balance when she bends down to eat or drink. She’s also gotten very good at hoping – she’s really very fast – so she gets around okay. She can’t get up into the tree, or onto a roost in the house, so she’s just sitting on the floor in the house at night, but that seems okay for her. And we’re still treating her with the comfrey tea – I made a fresh batch just today. Edited again to add: It’s around one and a half months now since Ocean broke her leg, and she is virtually as good as new, and happily keeping up with her flock mates, like she’d never had a broken leg at all. Note: Here’s a resource offered by a reader (in the comments below): To find a bird vet in Australia, see http://www.aavac.com.au/. ← 5 Eco-Friendly Activities for Kids – Be Crafty and Green in 2013! I’m very impressed! I would have thought she would have died. They don’t seem very tough usually. Well done! And I just realised I should have added a couple of other things we’ve done too, namely, added apple cider vinegar to her water and milk powder/yoghurt to mash for her, to increase calcium and protein intake. I’ll add them up into the main post when I get a minute. Hi – I have to say I love your website and the great natural tips. I am not so thrilled on your treat your own chook advice however. A broken leg is excruciating and your treatment borders on animal cruelty. If you are going to have animals you need to be committed to getting the proper care and that includes forking out the money for a vet. In this case one that sees birds- and there are a few. Check the the website http://www.aavac.com.au/ to find an avian vet near you. Avian bones normally set in 2 weeks so at 3 weeks with still not much weight bearing something is not right. Your supplements are very good, but some analgesic and antiinflammatories, plus a proper splint ( you should have included the foot) would have been the preferred treatment. And applying awake is cruel! So, sorry to be harsh, but having a blog like this is encouraging others to do the wrong thing. If you can’t afford care cut her head off and eat her. That would be the Sustainable Suburbia thing to do. Stephanie Shaw has the most crass way of helping I must say!! Thank you Kristen for your story on Ocean. My chicken’s leg is broke she cost me $10.00 so I will not spend $100 at the vet. Like you I will try the splint. How much apple cider vinegar do I put in the water. Also I don’t have those leaves you used. Thanks. If you don’t have comfrey, can you find some plantain? Where I live it’s a common weed. I found some good pictures of it on this page: http://www.patheos.com/blogs/confessionsofapagansoccermom/2011/07/herb-hunting-in-your-neighborhood-part-2-plantain.html or just do a google image search in plaintain, if you don’t know how to recognise it. Good luck, I hope her leg heals and she does okay. I don’t understand people who have animals and then don’t take them to the vet when they need to. When you get an animal you are responsible for that animals quality of life . I understand that a vet can be expensive but I could never live with myself if I did not try everything to save an animals life. I’m not rich by anything means but I have taken my chickens to the vets when they needed it. My little Ethel was egg bound and I took her to a vet that was 1 1/2 hr away at 11:00 at night. 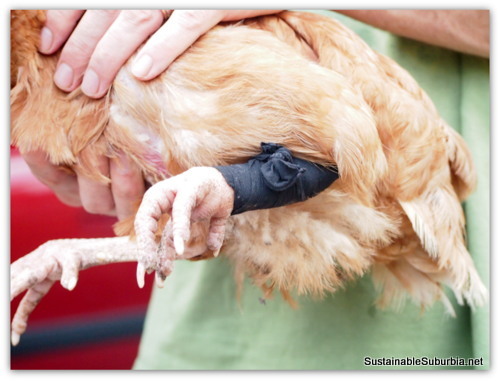 They were able to get the egg out but within a few hours another egg was bound so she had to be euthanized. But at least I fill that I did everything I could for this sweet little chicken that I took responsibility for. This cost me $400.00 which is a lot to me but it was worth it. If you don’t want the cost don’t have animals. Thanks for your honest feedback. I can see your point of view. And good to know that bird bones set in 2 weeks, I didn’t know that. Are you a vet? I looked for information on how long it should take to set but was unable to find any. I guess I was following the advice in the various books I’ve read on natural poultry care. Chopping her head of was an option, but as it is, two months on she is as good as new, and perfectly happy. Should I have cut her head off to save her that period of pain? I don’t know. We certainly wouldn’t say that for a human. If they broke their leg out in the bush somewhere with no anaesthetic or help available you would just do the best you could to make sure they survived. However, getting hold of some anitinflammatories/analgesics would have been smart, and kind, you are right. I didn’t set her leg – I agree that would have been too painful and besides may have done more harm than good. But I figured having it splinted was going to give it a better chance to heal than not. I suppose it might have healed more quickly if properly set first, but I didn’t think it was worth the risk. Thanks for your comment and the link to the website, I will add that into the main content of the post. Am interested to read that this worked. We had a similar experience a while back with a guinea pig with a sore eye. I was hesitant to take her to the vets because of the cost – but then after 3 visits and minor surgery under anesthetic the total charge was $35! The lovely vet said that they charge less for some type of pets so as not to deter owners from bringing them in. Although I’m suspecting its just cause he’s a country vet as i can’t imagine a city vet doing this. But, after conversing with Stephanie (the commentor above) by email, I would probably at least call the local vet on her list (by local I mean just outside the ACT) and chat to them. But, Ocean is as good as new now, and happy as larry, so I am glad we didn’t just do the standard thing of turning her into soup! Hi Evonne, it sounds like you are doing the right things. Could you call the vet and ask how long they expect the splint to need to stay on maybe, just to get a sense? I have baby chick which is 3month old. But chick is bitten by big rat on his leg joint. I went her to doctor, they gave me antibiotic and cream for his leg. But 2.5 week. She can’t even walk and proper stand. Only jumps on leg for few seconds then seat. I bandaged her leg with warm turmeric paste. But Her health is very poor. I m worried about her. Plz tell what should I do?